When, in 1329, Mastino II della Scala inherited, along with his brother Alberto, the lordship of Verona from his uncle Cangrande, the good fortune of the Della Scala family was at its peak. Young and ambitious, Mastino II (1308-1351) wanted to further expand the domains of Verona, showing courage and valor, but not as much prudence and diplomatic skills as his predecessor. In fact, his lust of conquest caused alarm for the other Italian powers that joined forces against him and defeated him repeatedly. He finally managed to save his rule but, after ten years of being in power, his dominions were reduced only to Verona and Vicenza. 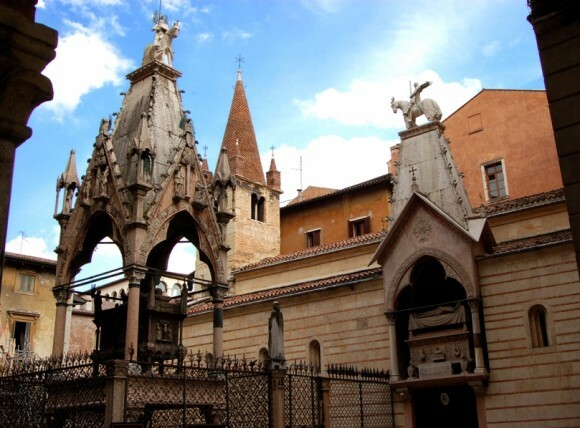 At his death, in 1351, he was buried in a magnificent Gothic tomb in the funerary complex of the so-called “Arche Scaligere” (Scaligeri’s Tombs), next to the Church of Santa Maria Vecchia. 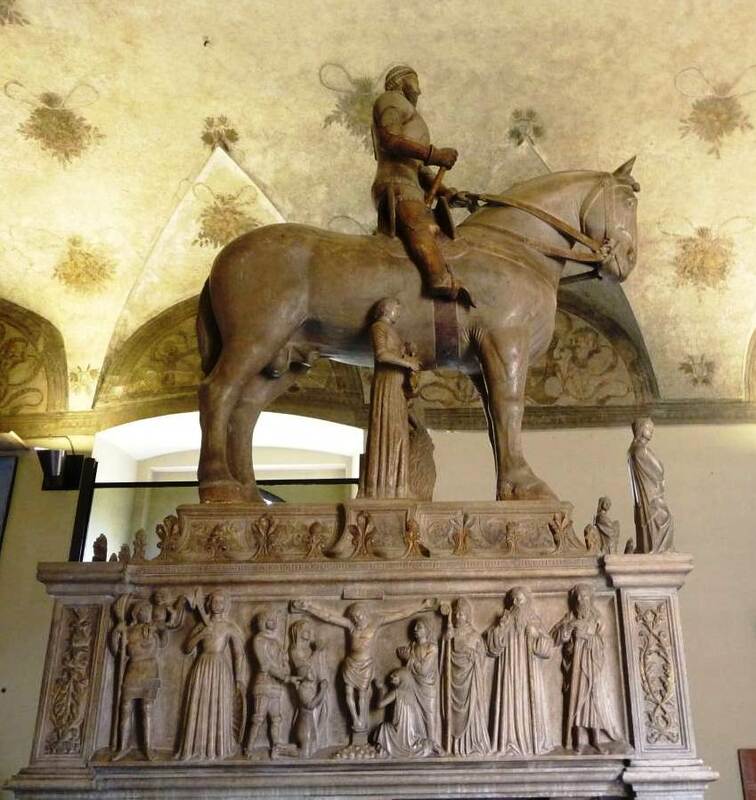 The tomb is crowned by a famous equestrian statue, the original which has been preserved since 1986, in the Civic Museum of Castelvecchio in Verona (Italy). The statue, made by an anonymous artist, around 1350, from a single block of limestone, portrays the lord and leader in the moment that precedes the attack in a duel. 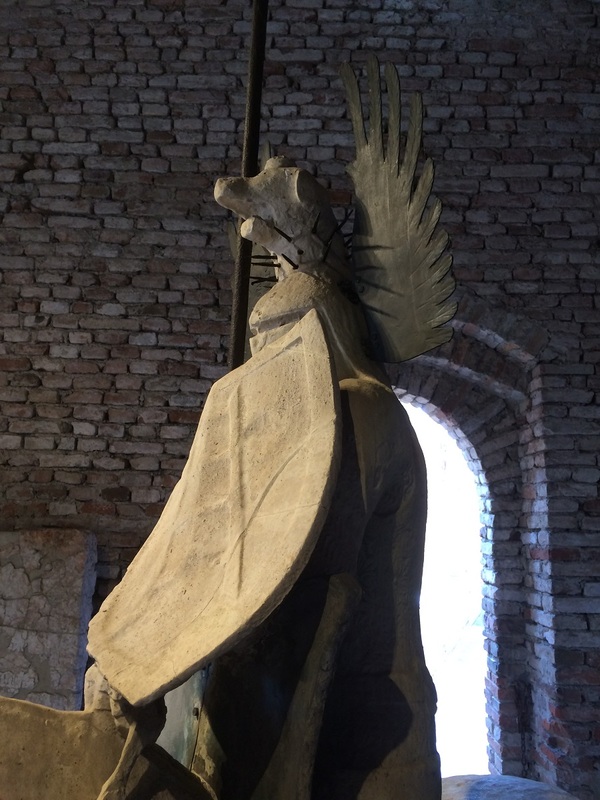 The knight is armed with spear and shield and protected by a hauberk, namely a tunic of metal mail, and by greaves, thigh-pieces, gloves and by a helmet surmounted by a winged mastiff. 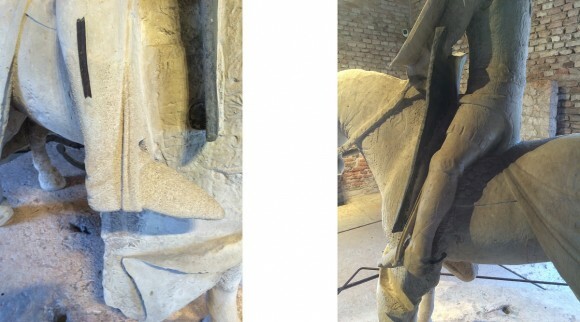 The horse is entirely covered by a voluminous damask caparison, on which the coat of arms of the Della Scala (a silver ladder in red field), is displayed both on the horse’s neck and cheeks. The headstall is topped by a helmet with a dog’s head similar to that of the rider. 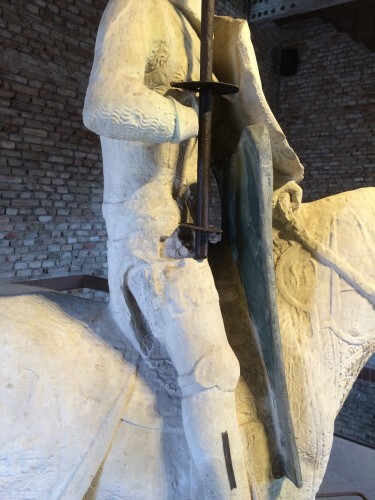 The extreme realism and accuracy in the details of the statue gives us a chance to look closely at the seat of a medieval knight. In particular, it gives us the opportunity to see represented one of the horseback riding techniques which was typical at the time and that we find described in the book of the Portuguese king Dom Duarte (1391-1438), Livro da ensinança de bem cavalgar toda sela (a previous article of this blog is dedicated to the different riding techniques in use in the late Middle Ages and the Renaissance: you can read it by simply clicking on the following link: “A la brida” and “a la gineta”). Mastino II rides standing in the stirrups. His position is facilitated by a special type of saddle, with a high and wraparound cantle, into which the rider leans his gluteus, and by a massive saddle bow which supports him and also protects his belly and his legs in battle from the blows of his opponent. The rider’s legs are straight, with his feet brought slightly forward. This is clearly one of the two techniques of the so-called “a la brida” style described by Dom Duarte. 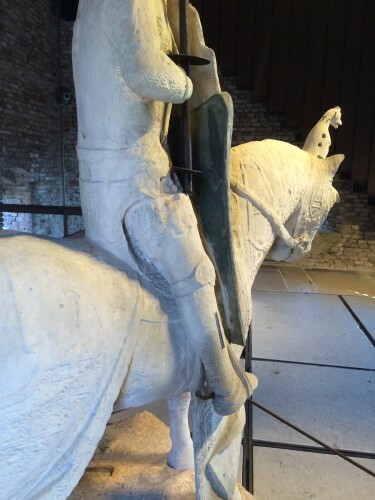 This way of riding a horse consisted exactly in keeping the legs stretched, but it was used in two different styles. One consisted in riding deeply seated, keeping the feet forward; the other style instead consisted in standing up in the stirrups, never sitting on the saddle. According to Dom Duarte, this second technique was older and, in fact, the statue of Mastino II precedes, by more or less seventy years, the book of the Portuguese king. The rider keeps his feet parallel to the sides of the horse to avoid accidentally hitting him with his long spurs. Given the position of the feet and the bulk determined by thigh-pieces and greaves, the contact with the sides of the animal was not easy at all. This explains the length of the spurs’ shanks, which today seem to us inconceivable. We find the same kind of seat in the equestrian statue of Bernabò Visconti (1323-1385), who was lord of Bergamo, Brescia, Cremona, Soncino, Lonato and Valcamonica and ruled Milan with his brothers Matteo II and Galeazzo II, from 1354. It surmounts his tomb, now in the Museum of Ancient Art of the Sforzesco Castle in Milan, but in the past it was placed behind the main altar of the now demolished Church of San Giovanni in Conca. The work is, more or less, a decade later than that which portrays Mastino II. It was carved in 1363, by Bonino da Campione (1323-1397). It shows the condottiero mounted on a mighty courser. 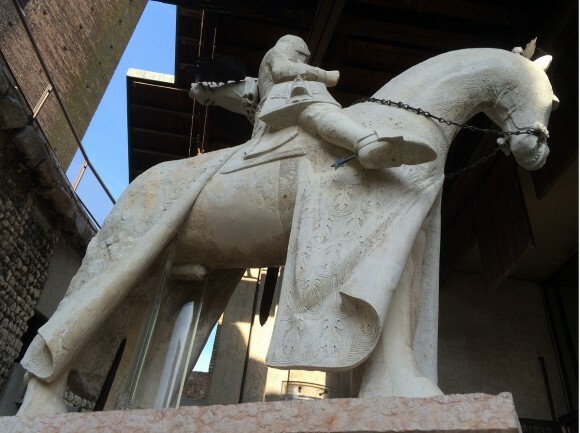 The seat of the rider is almost identical to that of the statue of Mastino II. He rides his horse in a standing position, leaning against the high cantle of the saddle and keeping his legs stretched out. Note that, in the Visconti monument also, the bit is precisely represented. The horse is harnessed with a kind of full cheek snaffle, with double reins. Probably the additional rein had only a safety function and was used just in case the main one got broken, or was cut during a duel, or in battle. In fact, it is simply kept on the horse’s neck and is buckled to the same ring as the other rein. 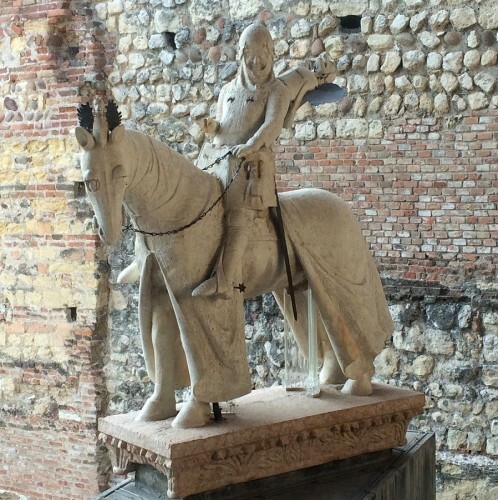 The Scaligeri Tombs in Verona offer us a further testimony of the truthfulness of Dom Duarte’s description of the riding techniques in use in the late Middle Ages. Next to Mastino II’s tomb, just above the door of Santa Maria Antica, there is the tomb of his predecessor, Cangrande (1291-1329). 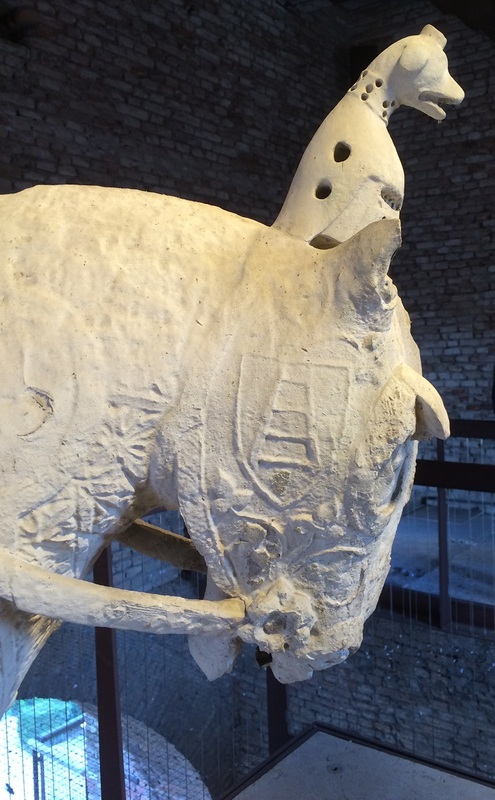 Even in this tomb the sarcophagus is surmounted by an equestrian statue, whose original is preserved in the Castelvecchio Museum. Cangrande appears in an attitude much less martial than his nephew. He looks to be portrayed during a break, before or after a fight. He keeps the helmet fastened on his shoulders and shows a benevolent and smiling expression on his face. He sits deeply in the saddle, keeping his feet forward, up to the horse’s shoulders. His knees are almost stretched out. Cangrande’s riding position is exactly the one described by Dom Duarte in the second chapter of the third part of his treatise. 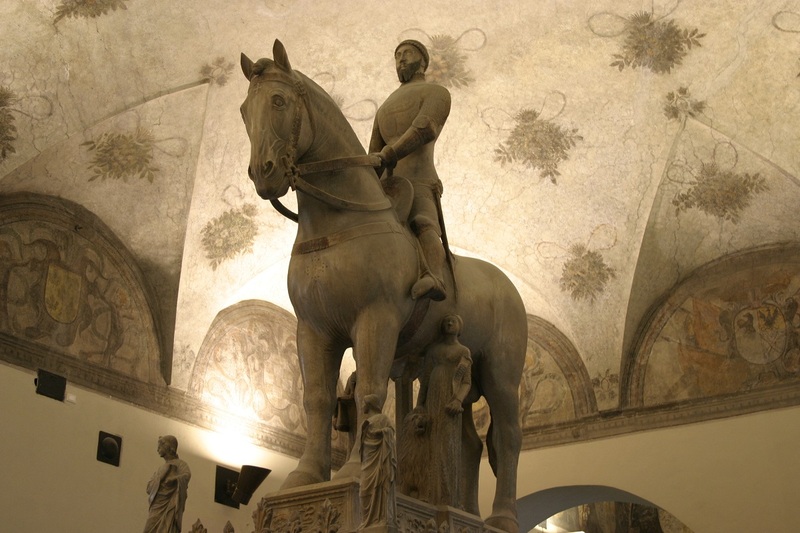 The different seat shown in the statue of Mastino II may induce us to think that knights adopted a standing position in the stirrups during fights in order to better manage the long spear, but they would sit on the saddle, with their feet forward, during travels and pageantries. It is certain that the sitting position, with feet and legs stretched forward, became the most used in the following two centuries by heavy cavalry. We find it in many equestrian portraits of the fifteenth and sixteenth centuries. The position of the feet will be then gradually moved back to ensure a more effective and precise use of the lower aids with the advent of academic riding. I loved reading all this history and viewing the photos. I was amazed how the knights rode with their legs very forward to the front of the horse. I would think this would hinder the horse’s ability to walk for any length of time with the armor restricting the shoulder movement. It’s true Carol. I agree that the ancient “a la brida” seat was not very “functional”. That’s probably why it was abandoned through the centuries. Since the rising trot wasn’t invented yet, riding with legs forward and body leaning back into the cantle was probably the most comfortable at the trot. But for walk and canter it makes no sense. I wonder to what extend they were concerned about how well a saddle should fit a horse in those days. 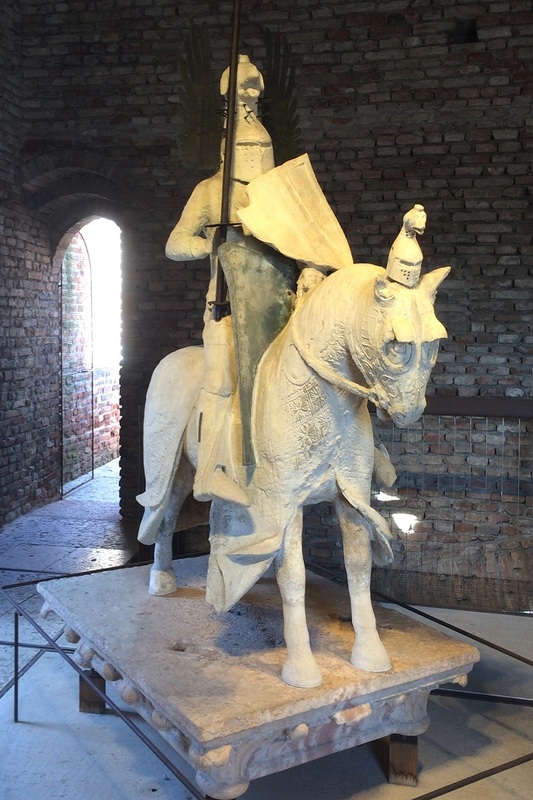 I’m sure they were primarily concerned with the safety of the knight, but the horses ability to move properly was tied to the fate of the rider. I love this website. I am an avid historical equitation fan! Thank you Bert! I’m very glad of your appreciation. I agreed with you that at that time there was not very much concern about the horse’s welfare.